When you think of a quality sewing needle, you think SCHMETZ! 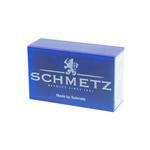 Since 1851 SCHMETZ has been the leading manufacturer of quality sewing machine needles in the world. Are you looking to purchase Schmetz needles in larger quantities than on cards or packs? Perfect for the power sewing enthusiast or those who wish to keep a ready supply of needles on-hand. Available in regular (nickel-plated) and chrome in a variety of styles and sizes. 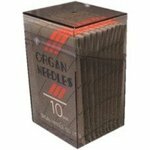 Needles come 100 loose per box.